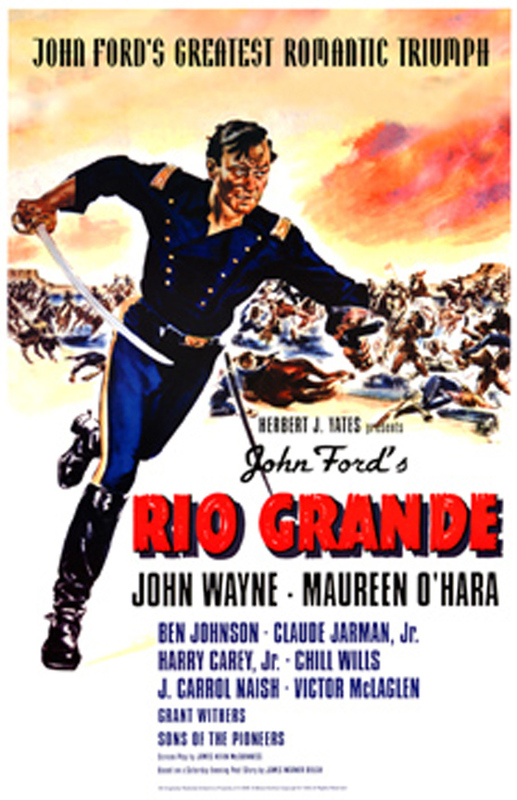 Here we go -- Fred, Ginger, the Carioca, The Russo-Polish War, Pan Am, Clipper travel, Special Effects, Elephant Stampedes, King Kong, Amelia Earhart, the Doolittle Raid, and John Wayne all in one stretch of the imagination. Fasten your seatbelt! Although many megabytes have been written about the film, there is very little information about the "Aerial Ballet". Although the sequence was filmed with "trick photography" the airplanes used are actually real and will be identified in just a bit. Without further ado, here is the "Aerial Ballet" or the "Skyshow." These visual effects were the work of Linwood G. Dunn, A.S.C. (1904-1998), an Academy Award-winning pioneer of visual special effects in motion pictures and inventor of related technology. Dunn created startling effects for landmark cultural influences from King Kong through the original Star Trek series. He invented technology that allowed him to merge two images on a frame by frame basis while controlling for focus, lighting and other factors. 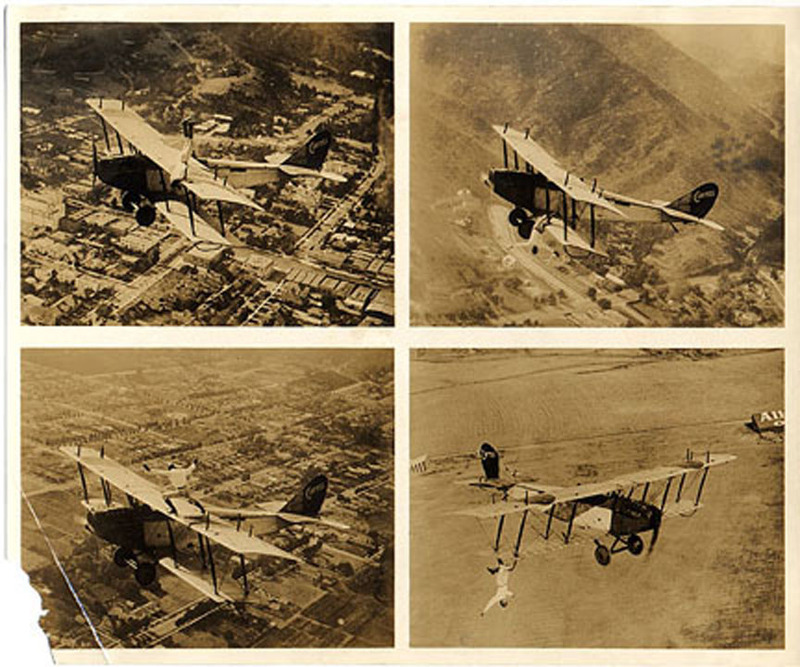 Thus, the girls could be safely mounted on stationary airplanes and photographed against a background of Rio to give the illusion that they were actually airborne. Here is a short film that explains how the sequence was made. This is all very nice, but you are probably wondering why we are taking up space with this discussion. It turns out that there are some very important concepts at play here that might tickle your intellectual fancy. Briefly, the film is an extended commercial for Pan-Am (Pan American Airways, now defunct). The critical link is Merian C. Cooper, the producer of Flying Down to Rio and a founding member of the Board of Directors of Pan_AM, who served for decades. 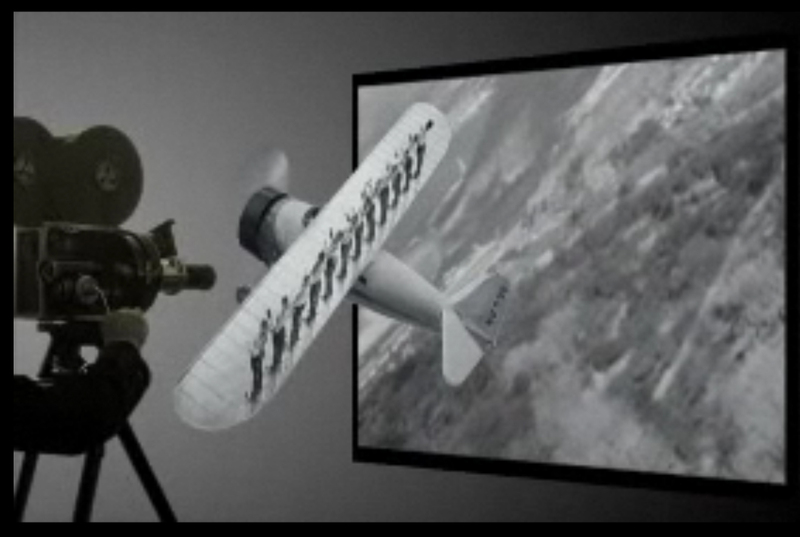 He was a pioneer in the use of aircraft, military and civilian, as well as a motion picture innovator. His biography is of interest to both aviation enthusiasts as well as film buffs, so you'll forgive a brief digression here. Cooper was a DH-9 bomber pilot during World War I. He was shot down and captured by the Germans, serving out the remainder of the war in a POW camp. 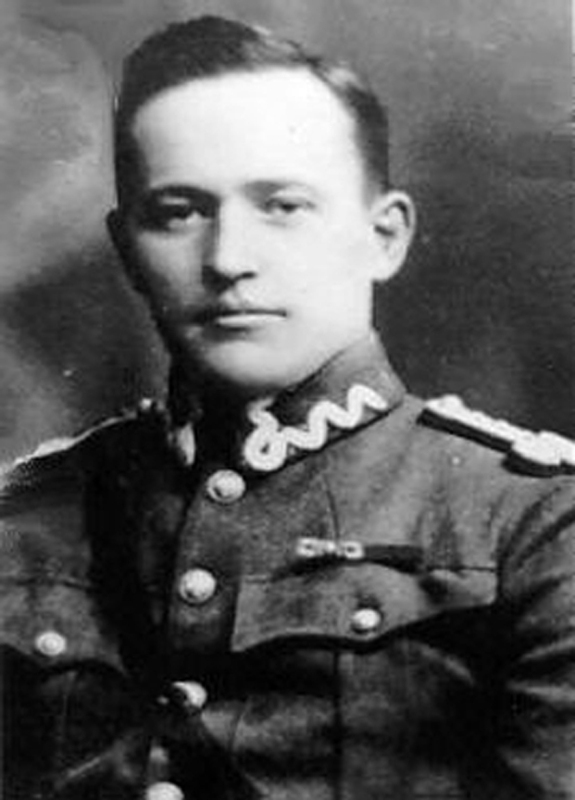 From 1919 until 1921, Cooper was a member of a volunteer American flight squadron, the Kosciuszko Squadron, which supported the Polish Army in the Polish-Soviet War. During World War II, he was commissioned as a colonel in the U.S. Army Air Forces, and served as a logistics liaison for the Doolittle Raid. He was known for his hard work and relentless planning. 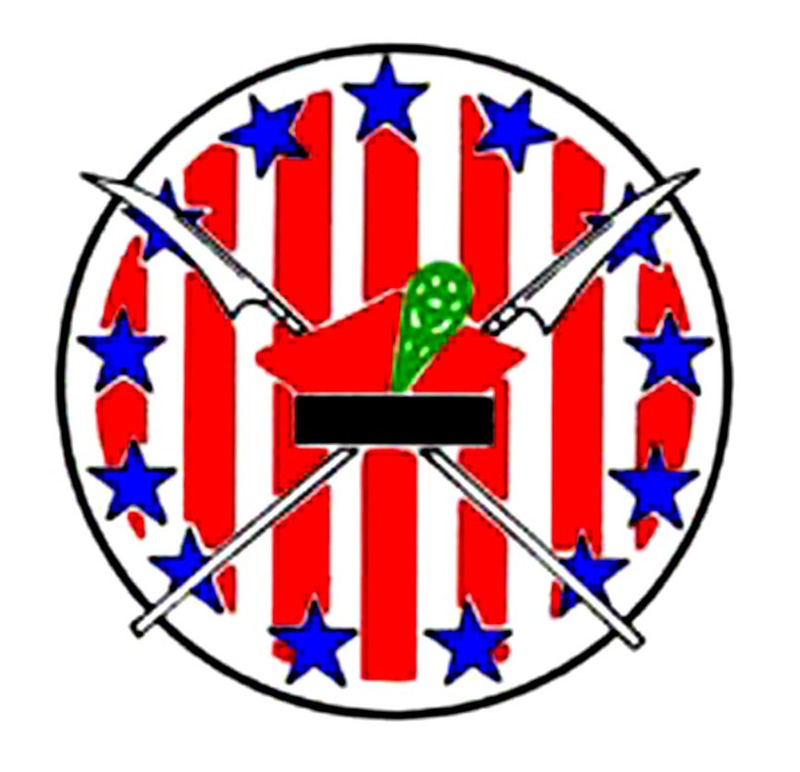 At the end of the war, he was promoted to brigadier general. Throughout his civilian career in the film industry, Cooper had many roles: Producer, Writer, Director, even Actor. In all of these, he was a proponent of technical innovation. 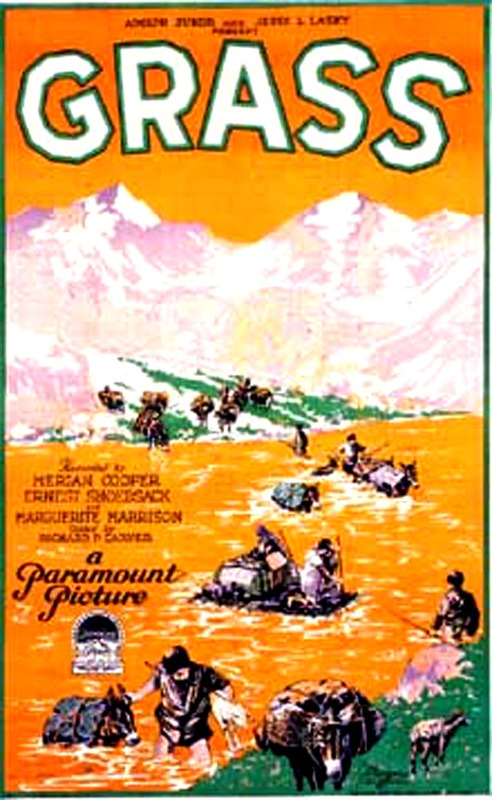 He started with documentaries for Paramount Pictures such as Grass(1925) and Chang (1927), which combined real footage with staged sequences. In Chang , he used this technique to create a memorable finale featuring an elephant stampede. 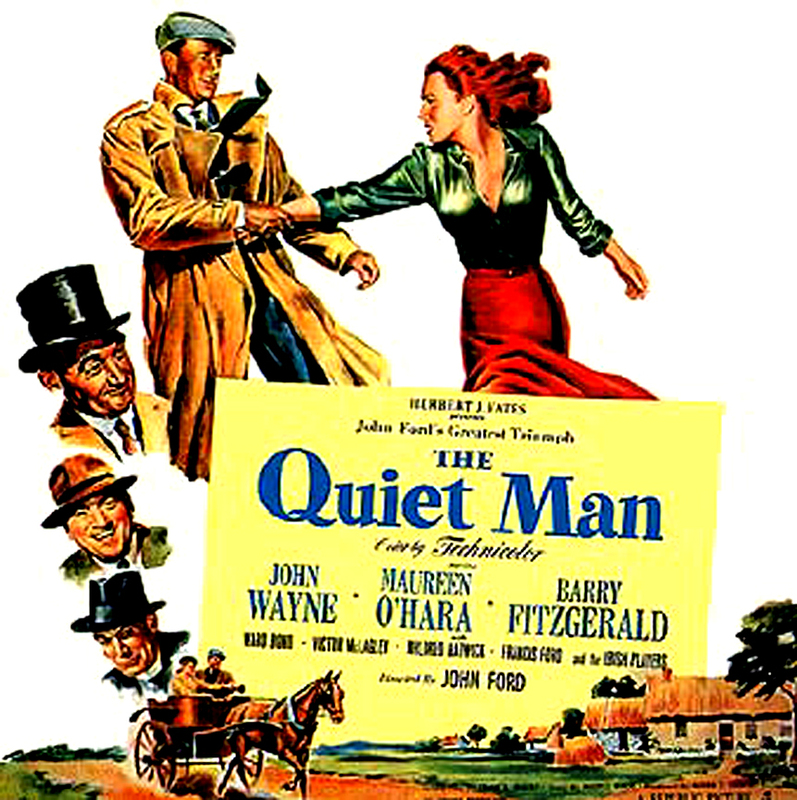 After this, Cooper led movie production for RKO Radio Pictures before and after World War II. His first production was King Kong, which he co-wrote, co-directed, and appeared in. The film was also a technological breakthrough in the use of stop-motion animation and the traveling matte process. 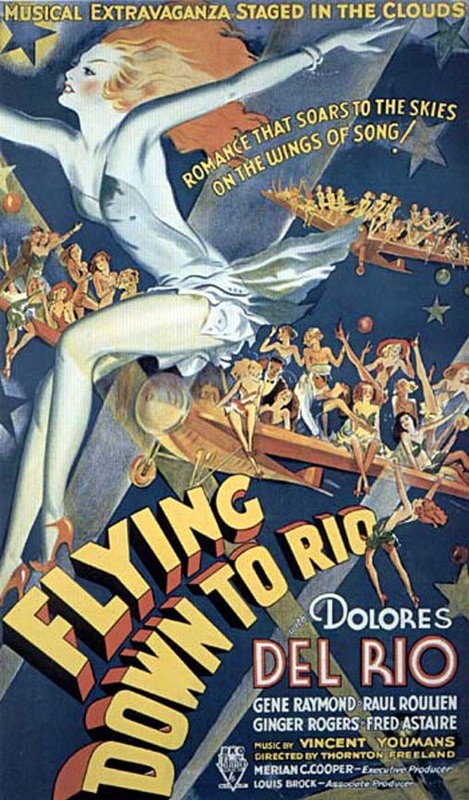 Flying Down to Rio was Cooper's second film for RKO and was released in 1933 as well. 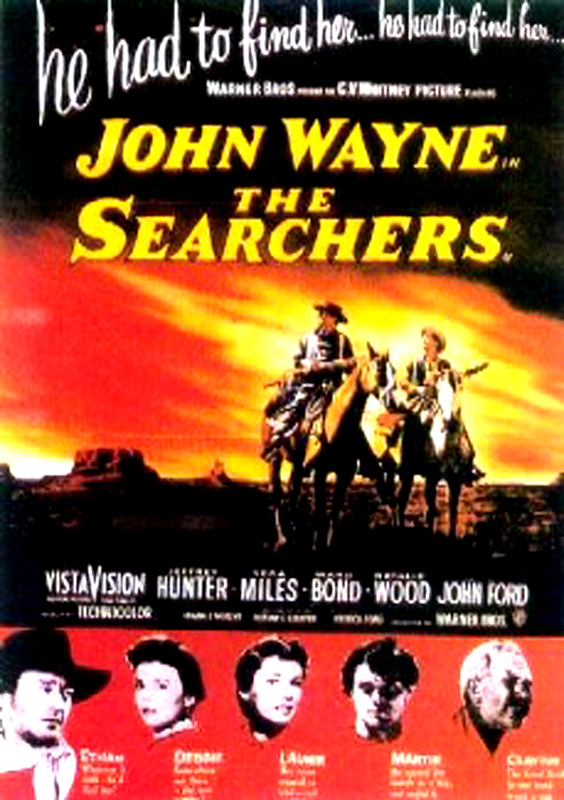 After World war II, Cooper was a frequent collaborator with John Ford. 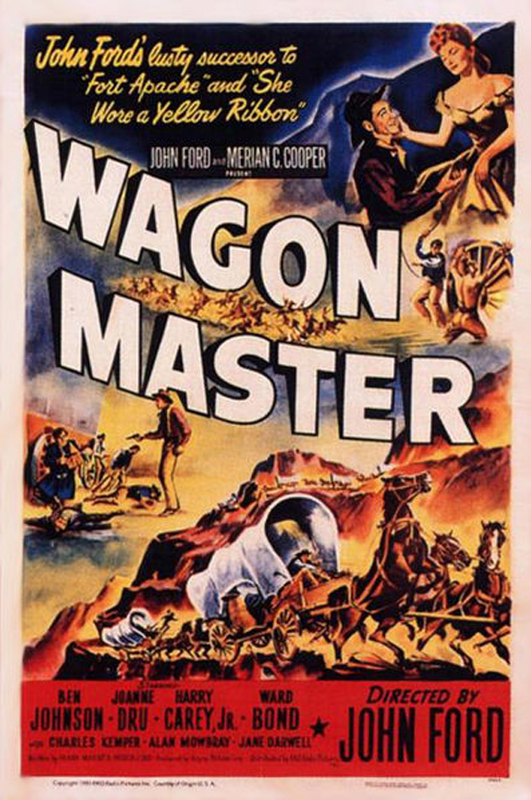 They produced such notable films as Wagon Master (1950), Rio Grande (1950), The Quiet Man (1952), and The Searchers (1956). Cooper has a star on the Hollywood Walk of Fame (his name is misspelled "Meriam C. Cooper"). 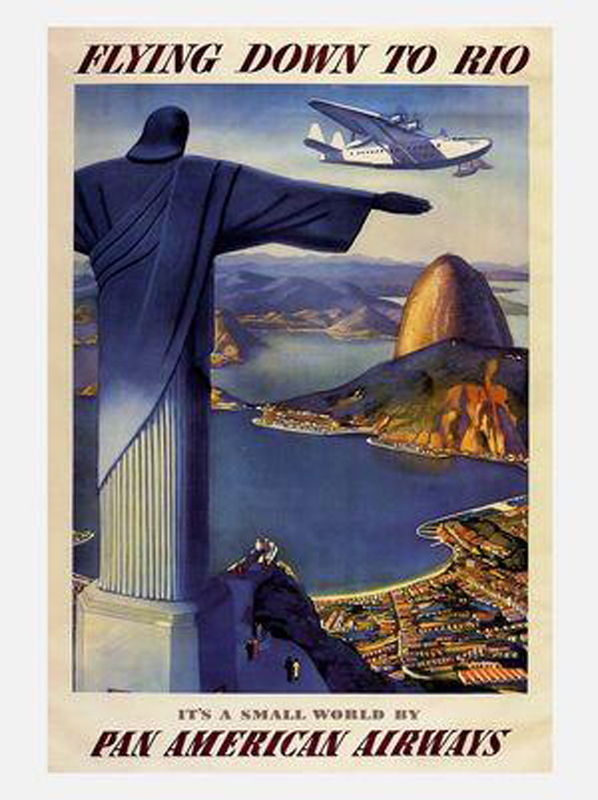 With the backing of powerful and politically-connected financiers who included William A. Rockefeller and Cornelius Vanderbilt Whitney, war hero Maj. Hap Arnold and entrepreneur Juan Trippe founded the fledgling Pan American Airways in 1927. Their operation acquired a monopoly on landing rights for Havana, and obtained a contract to deliver mail between Key West and Cuba. 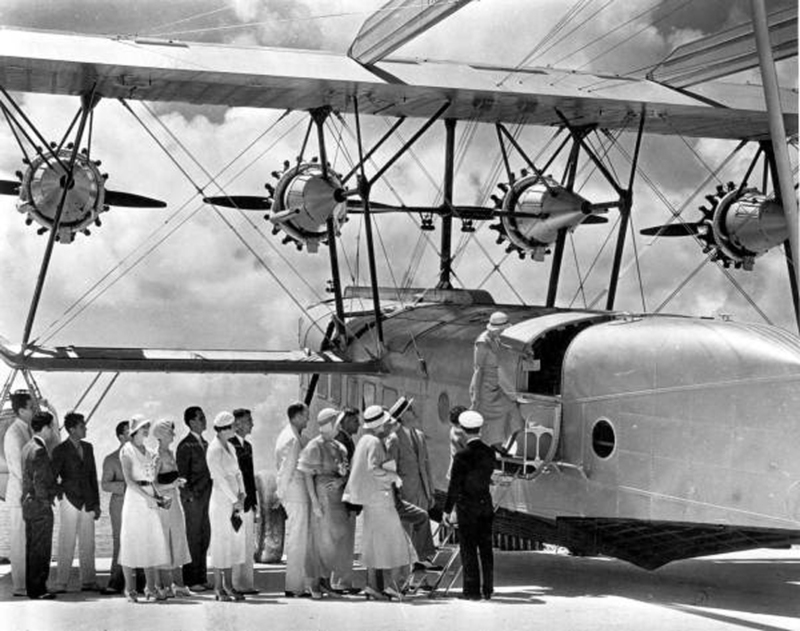 Initially, the airline used Douglas M-1 mailplanes; later they began to use the Fairchild FC-1 which could also carry passengers. Due to astounding political ties, the U.S. government insulated Pan Am from its American competitors, seeing the airline as the "chosen instrument" for U.S. foreign air routes. Benefiting from a virtual monopoly on foreign routes, Trippe extended Pan Am's network through all of Central and South America by purchasing a number of ailing or defunct airlines. 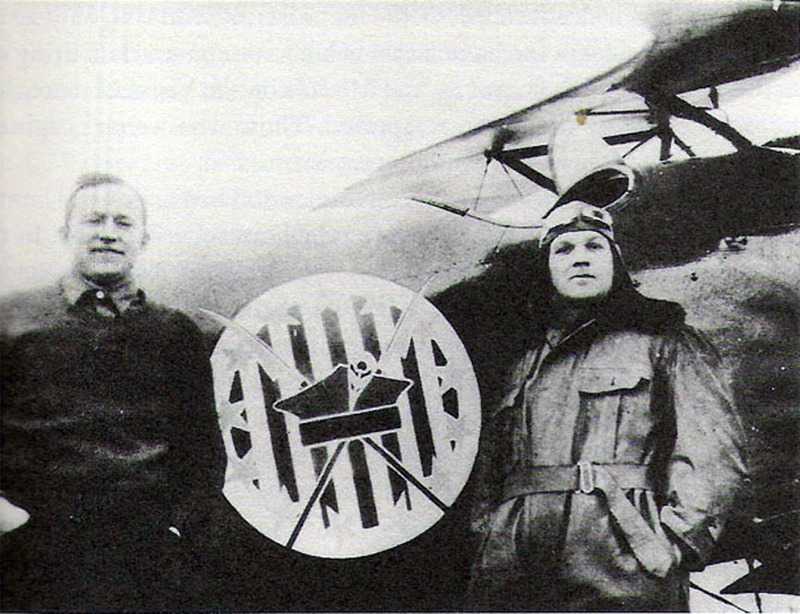 In September 1929, Trippe toured Latin America with Charles Lindbergh to negotiate landing rights in a number of countries. 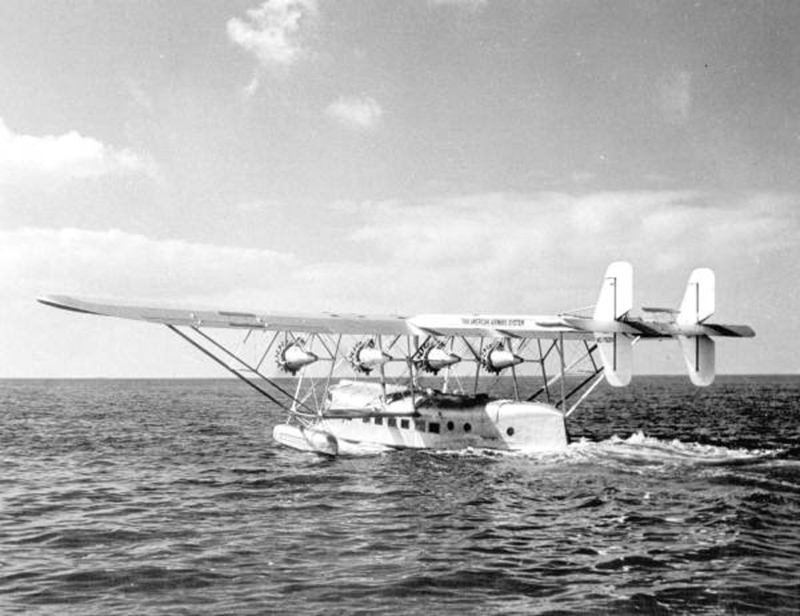 By 1930, Pan Am purchased the New York, Rio, and Buenos Aires Line to obtain a seaplane route along the east coast of South America, thus making "Flying to Rio" a possibility. 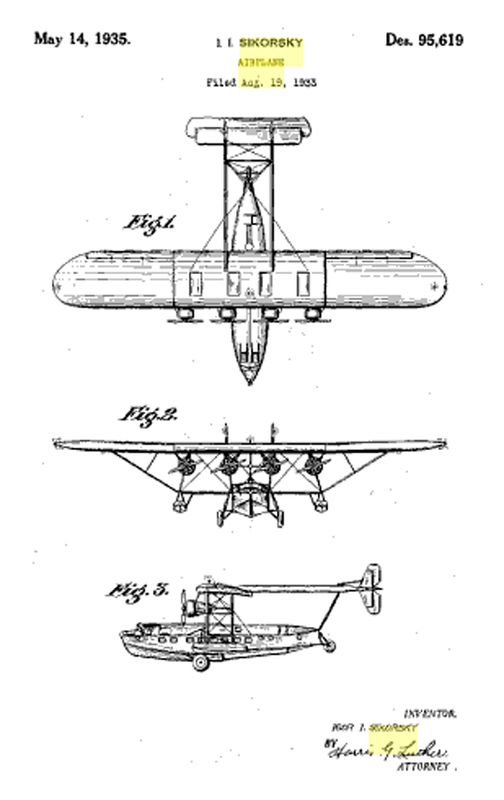 Pan Am acquired Sikorsky S-40 flying boats for these routes. 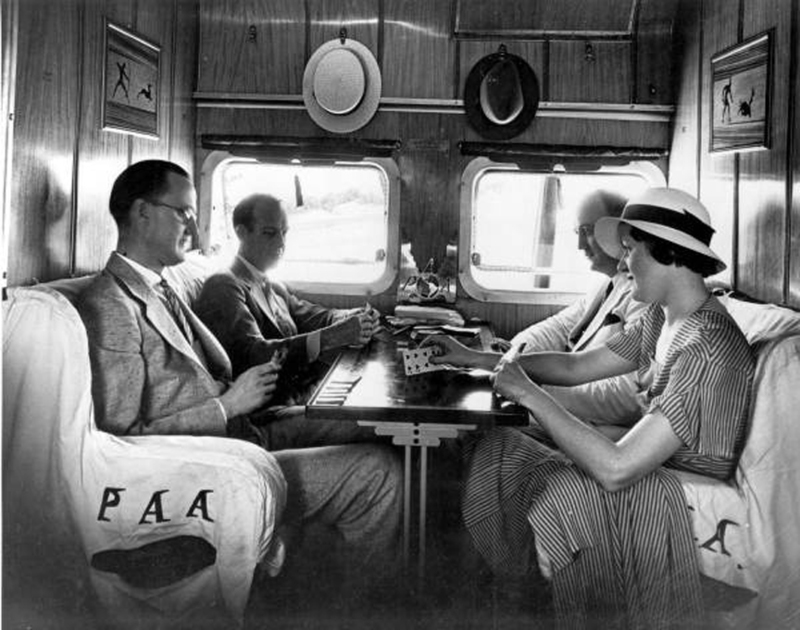 Due to both its gilt-edge backing and use of celebrities like Lindbergh, Pan Am was one of the hottest stocks of 1929, and flurries of speculation surrounded each of its new route awards. Fares were high, on the order $5,000-$8,000 in 2010 dollars. There was also an element of risk involved in air travel. So, in order to woo wealthy customers away from ocean liners, Pan Am began a campaign to portray air travel as glamorous and romantic. "Flying Down to Rio" makes this case very well -- the stars are young, beautiful and (most important) are either very wealthy or very talented. Flying is shown as a matter of fact mode of transit -- the male lead even has a piano in his airplane so that he can compose music en route. Later, he gives the female lead a "lift" from Miami to Brazil and uses the "out of gas" ploy to make a pass at her (in Haiti.) The "Air Ballet" shows that flying is so safe, that a virtual army of showgirls can dance, wave, and even do trapeze stunts atop the wings. The myth that a captain of a liner can perform marriages is extended to the new Clipper planes, suggesting that fashionable lovebirds can tie the knot while cruising at about 5,000 feet. Last, the rejected lover proves to be a good sport and parachutes out of the airplane, leaving the field clear for the two leads. 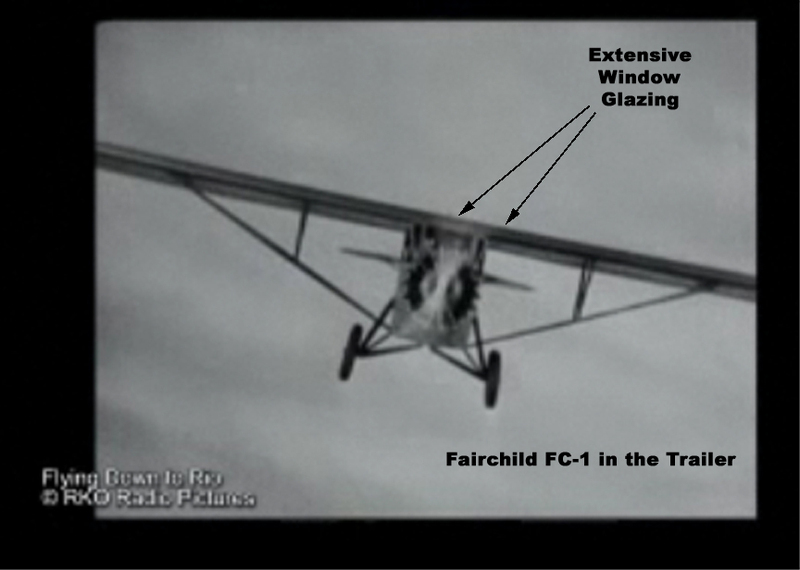 The Faichild FC-1 makes an appearance as Roger Bond's personal airplane, complete with piano. 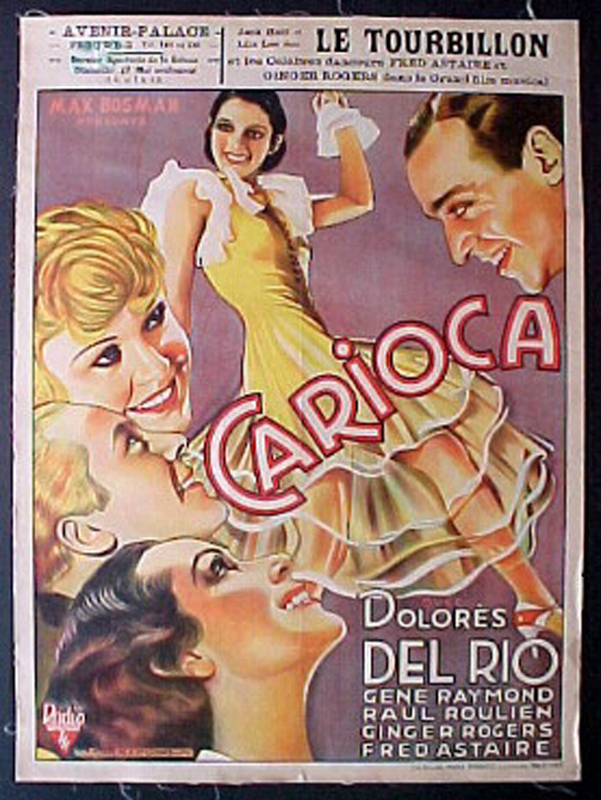 Bond (played by Gene Raymond) pursues the elusive and well-chaperoned Belinha (played by Dolores del R�o) in Miami. This is the plane that he uses to fly Belinha ostensibly to Brazil; with well-feigned mechanical problems, he sets the plane down on what appears to be a desert island and woos her in the moonlight. 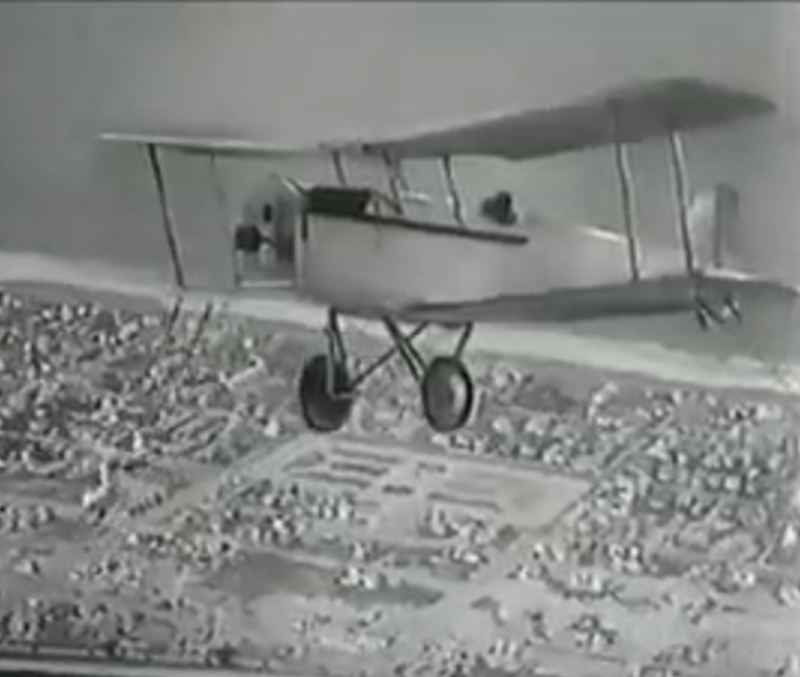 Later, the FC-1 makes its appearance in the Aerial Ballet. 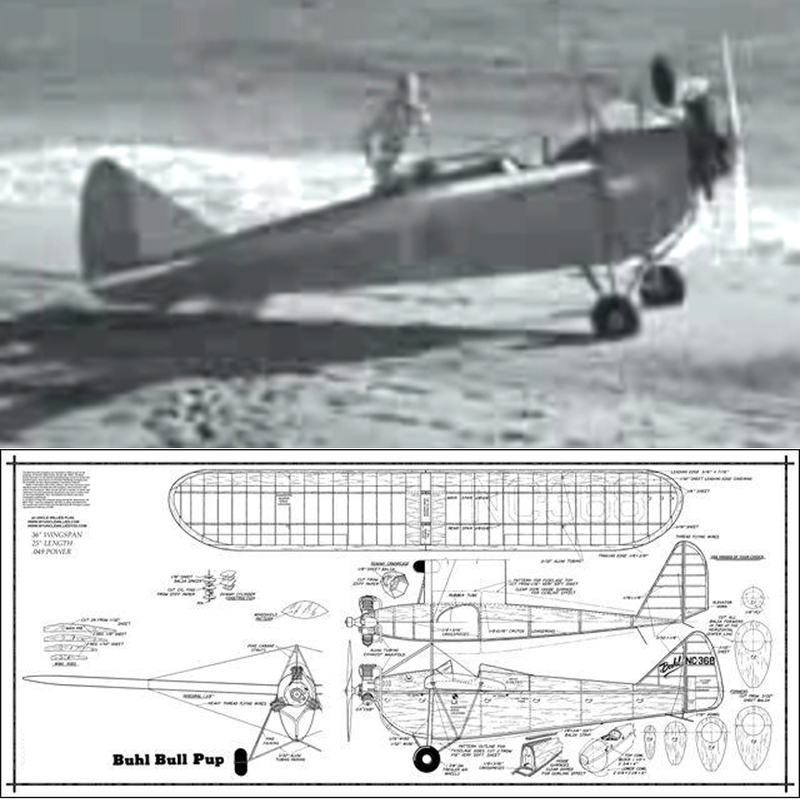 left: Roger and Belinha on the "Desert Isle"
The Fairchild FC-1 and its derivatives were a family of light, single engine, high wing utility monoplane produced in the United States in the 1920s and 1930s. 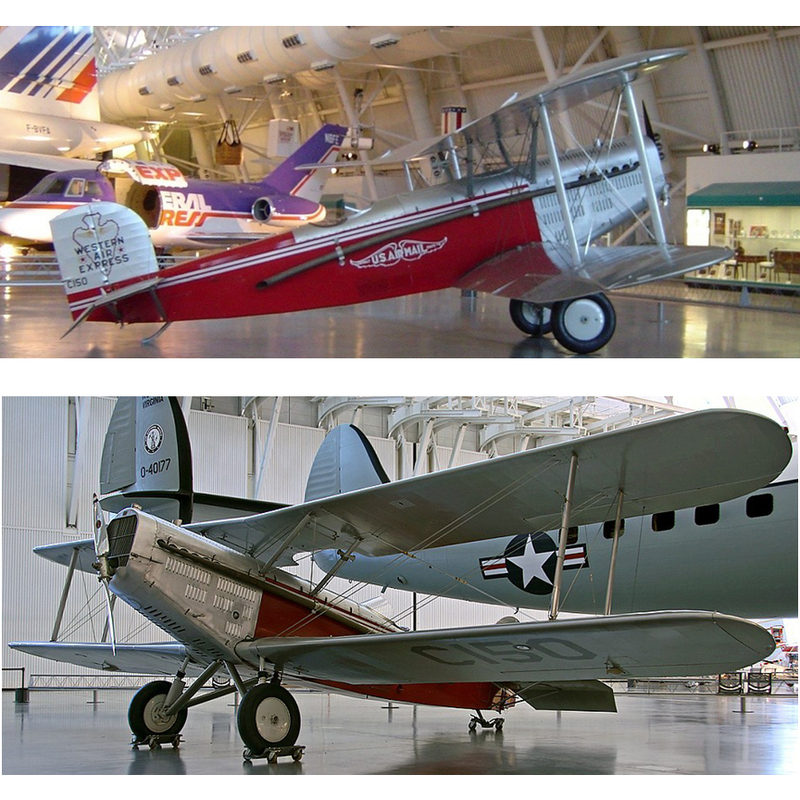 The aircraft was originally designed to provide a camera platform for Sherman Fairchild's aerial photography and survey business, Fairchild Aerial Surveys. To facilitate its intended role, the cabin was extensively glazed, offering plenty of vantage points for photographers. This is quite evident in the ballet which shows the multi-faceted windscreen. The Douglas mailplane was developed from the DeHaviland DH series of bombers and observation craft. Basically, a two seat airplane was connverted to a cargo carrier by covering one of the cockpits. By removing the seat, dual controls and armament, the plane could carry about 500 pounds of cargo. The principal difference between the deHavilland and Douglas airplanes is the engine -- the latter used the widely available "Liberty" engine that had a square radiator. 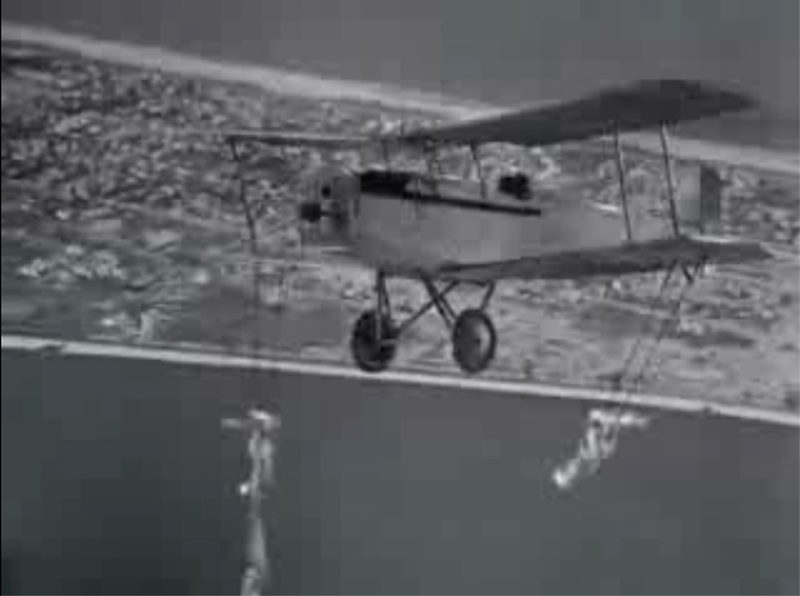 These airplanes were widely available on the surplus and barnstorming circuits by the time that "Flying Down to Rio" was filmed. 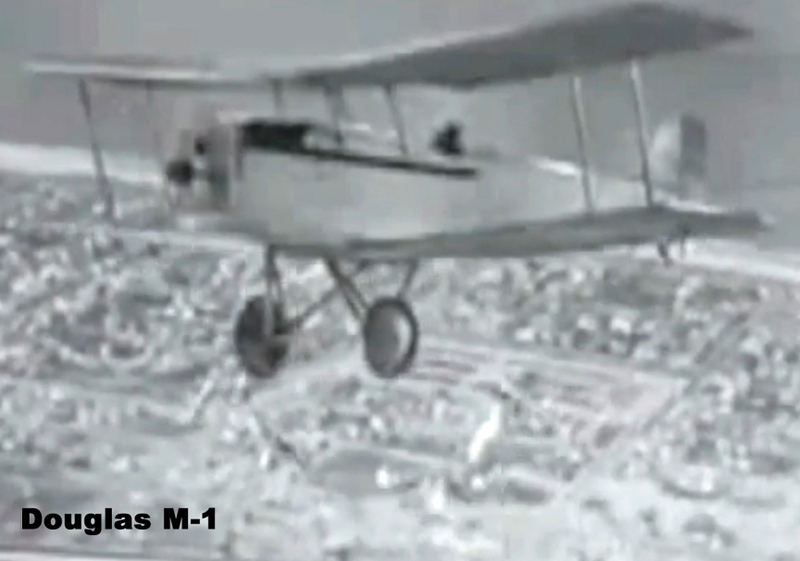 After extensive examination of the grainy footage, we can't tell whether the planes in the film were actual M-1s or mockups. Our best guess is that the only "real" M-1 is used in the "trapeze" sequence. The photo above shows Omer Locklear who not only walked on the wings, but also got out of the cockpit. So, did stunts on an aircraft made of cloth and wire without a pilot to correct for the change in balance as he hung from a wingtip. No safety wires and no net. Wingwalking is still performed today -- in the UK, there is even a team of attractive young ladies (called Utterly Butterly) who recreate some of the stunts from "Flying Down to Rio." The plane in the photos below is only shown from one view, leading us to believe that it was a model. We have studied the dancers on the wing and feel that they are an actual chorus line (not little clay figures as the photo on the left would suggest). This shot was probably done with a double traveling mat in which the model was superimposed on the background and then the dancers were superimposed on the wing. You will note that the dancers have restricted motion and the surface of the wing always remains white even when the shadow of another airplane passes over the background. 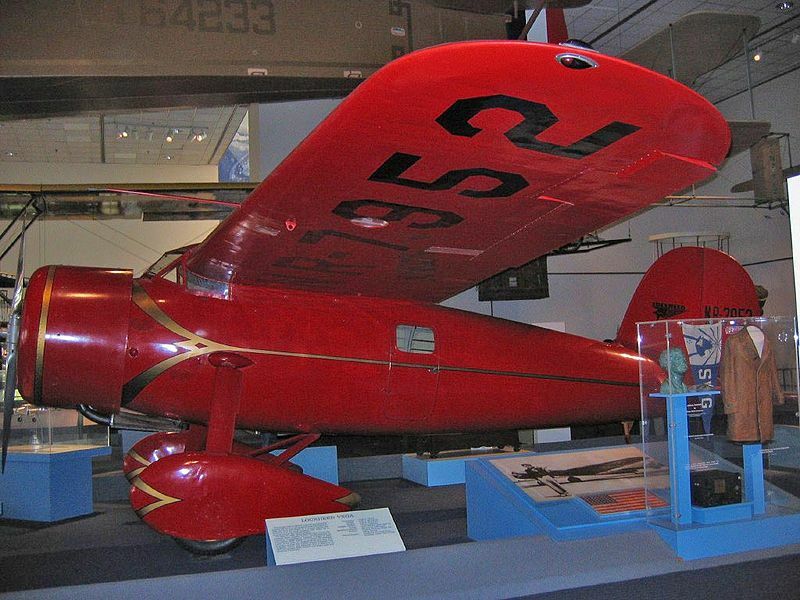 The real Vega was a six-passenger monoplane built by the Lockheed company starting in 1927. It became famous for its use by a number of record breaking pilots who were attracted to the rugged and very long-ranged design. 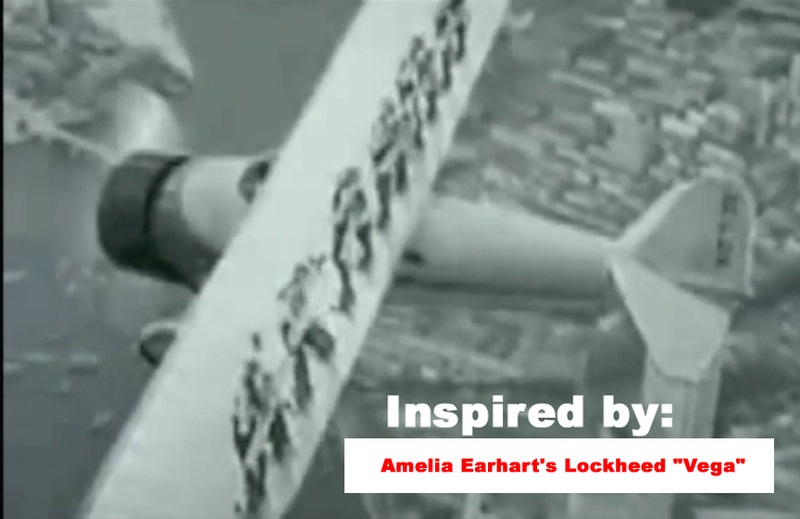 Amelia Earhart became the first woman to fly the Atlantic single handed in one, and Wiley Post flew his around the world twice. Thus, the plane would have been quite familiar to movie audiences. The real plane had a 41 foot wingspan that had enough space for 12 dancers. However, the plane could not lift the (roughly) 1,200 pounds of additional "cargo". In the film Roger informs his good friend Julio (played by Paul Roulien) that he has fallen in love, but finds out that Belinha is engaged to Julio. During rehearsals for the climactic Hotel opening, Fred Ayres (played by Fred Astaire) is told by police that the hotel lacks an entertainment license. 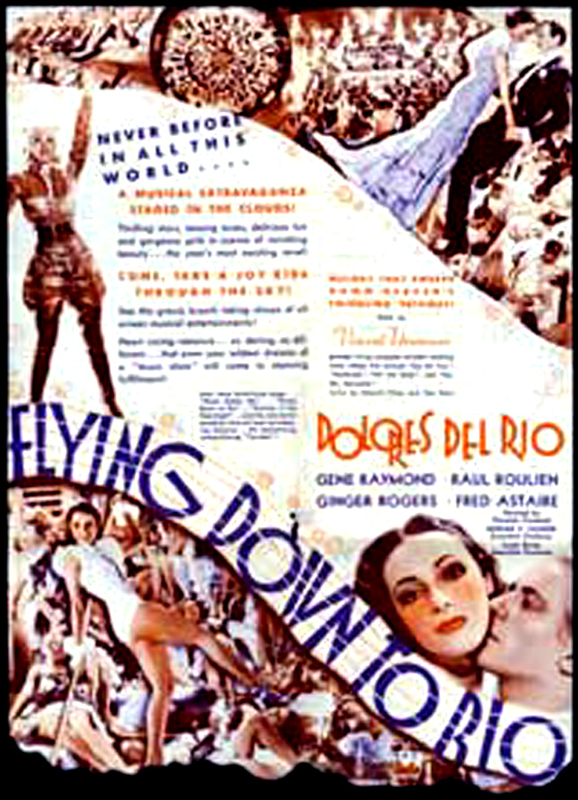 When Roger spots a plane overhead, he comes up with the idea of strapping dancing girls to planes, with Fred leading the band and Honey Hale (played by Ginger Rogers) and Julio leading the planes. Julio flies a Buhl "Pup" while Honey directs the ballet perched on the turtledeck. 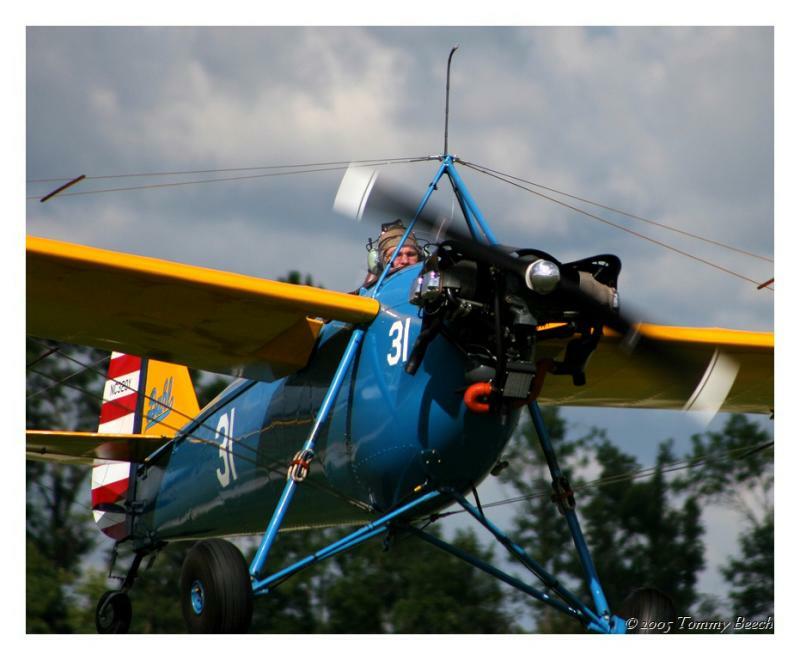 The Buhl LA-1 Bull Pup was a light sports airplane developed in the United States in 1930. It was a mid-wing wire-braced monoplane with fixed tailskid undercarriage and an open cockpit for the pilot. 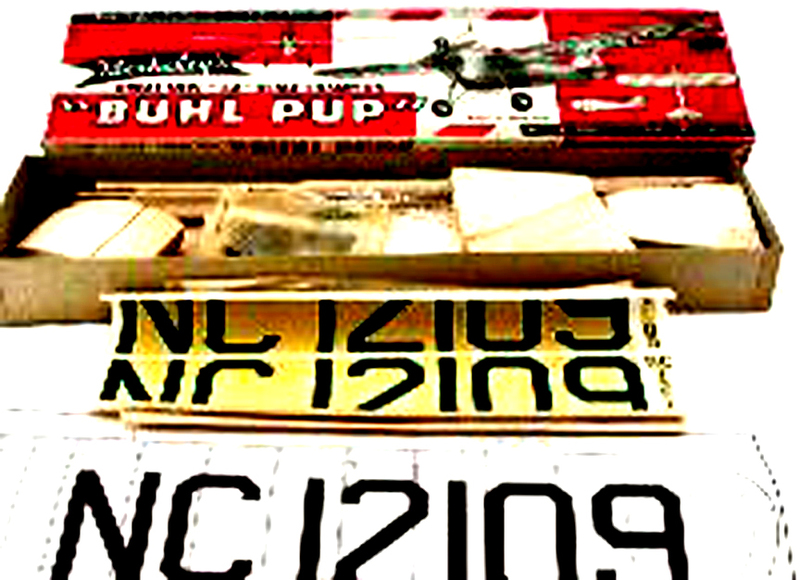 Buhl developed the Bull Pup as a cheap aircraft through which the company hoped to remain in business as the onset of the Great Depression was felt. However, as the economic situation worsened, it became evident that there was no demand for even such a basic aircraft; when production ceased in 1932, all aircraft still in stock were sold off at half price as the company folded. 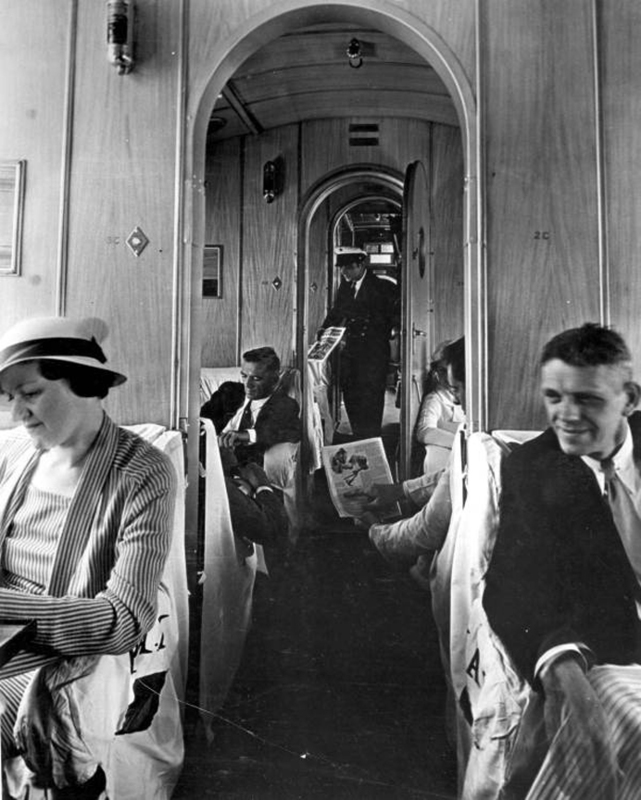 The next to the last scene takes place aboard a luxury PanAm Clipper. Julio drags Belinha away from her omnipresent chaperone and races headlong to catch the next Clipper departing for the USA since (he says) they can be married immediately by the Captain (Pilot). When they board the Clipper (through the unusual marine hatch shown in the photo), the reluctant Belinha is stunned to find Roger in the plane. Julio breaks the engagement so that the lovers can be married. He then jumps out of the plane and parachutes back to the Hotel. 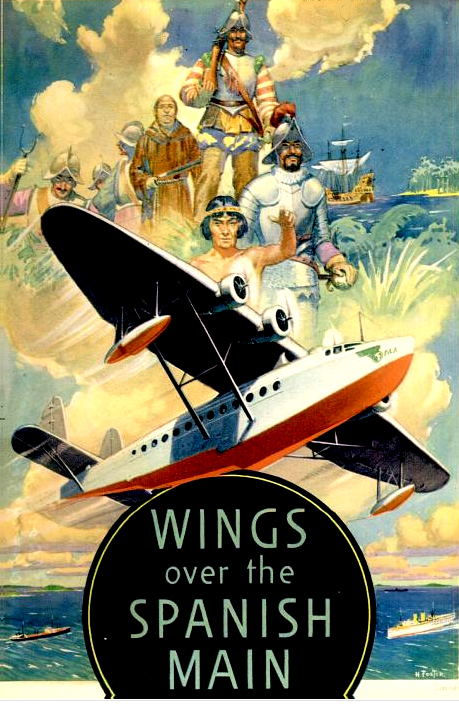 Click here to download a ".pdf" of the article "Wings Over the Spanish Main"
So, there you have it - Fred, Ginger, the Carioca, The Russo-Polish War, Pan Am, Clipper travel, Special Effects, Elephant Stampedes, King Kong, Amelia Earhart, the Doolittle Raid, and John Wayne all in one stretch of the imagination. You may unfasten your seat belt now.